I instantly recognized it as a piece by George Sugarman. It's in front of thoroughly anonymous industrial park at 8021 East Riverside Dr., right near the the airport. It's not a location where you expect to find art, much less art by a major American sculptor. The reason I recognized it so easily was that I had seen some of its brothers and sisters in Houston. This is in front of an office building on Sawyer St., just north of Memorial Drive in Houston. 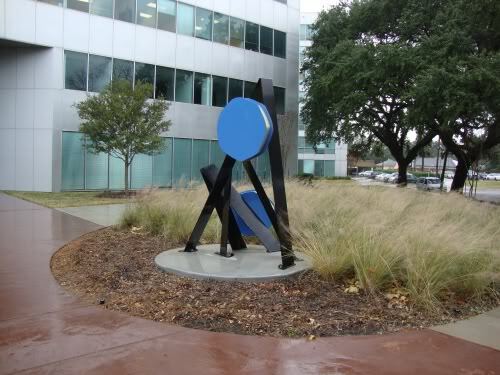 Both the Austin sculpture and the group of pieces around the building on Sawyer were once part of a much larger sculpture by Sugarman called the Saint Paul Sculptural Complex. You can read the story behind this sculpture and its weird "conservation by dismemberment" by Grubb & Ellis Realty in my earlier post about them. I knew there were more of these Sugarman fragments around, so I was quite delighted to stumble across one accidentally. This one has a plaque that tells a little bit of the story. What's funny is how self-congratulatory it is. Still, I'm happy that they saved this work, even in this oddly dismembered form, and I was quite delighted to stumble across this fragment in Austin.